A care giver is the one who will take care of the person with any disorder, often expecting nothing in return. Most often a care given is the spouse, the elder child or even a partner. •Keep the patient involved in the progress of their condition. •Allow the patient to think and take decisions. •Encourage the patient to care themselves and talk more about improving their personality. •You might get too frustrated while staying with the patient all the time. Give time to yourself and also take care of your own needs. •Ask for help when it is necessary for you. Asking for help will give time for you to relax. •Give support to yourself and the patient's family (if you are not a family member). •If you are working do not hesitate to appoint a nurse or a maid to fill your absence. •Make sure you give a lot of love to the patient. And tell them every time "love you" when you will see them feeling low. 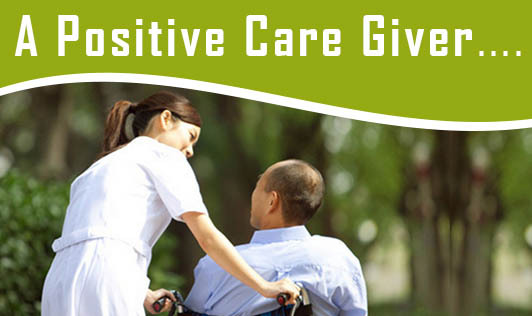 •Try to involve patient's siblings in the care giving progress. •If they have children, make sure they involve actively in helping you. •Try and understand their feelings so that the patient will realize how much you care for them. •Develop a support network, so that even in any kind of inconvenience there is a back up. •Make them laugh, and keep them engaged if they are idle.Make them feel they can lead a better life. •Take the patient with you to a party. •Give them confidence for everything. •Help them to get out of stress. •Take them on a holiday so that there will be change in place. •Too many people visiting might leave a patient irritated, arrange an event weekly once so that even for the patient it is refreshing and other days they can rest. As a care giver you hold an important place in the patient's life. Reward yourself for what you do! !